Tai Tiedemann had one of his better outings of the season last time out for the Spokane Indians against Eugene. The 6-foot-6 righty allowed one earned run on three hits and two walks over six innings with five strikeouts. He didn’t factor in the decision, however, as the Emeralds scored a run in each of the seventh through 10th innings to sneak away with a 4-3 win on Aug. 5. In fact, Tiedemann hadn’t registered a decision – win or loss – since July 5 despite pitching more than five innings in three of his five starts. On Tuesday, the former eighth-round draft pick once again eclipsed the five-inning mark, retired 11 in a row at one point and allowed just two base hits. And while it looked dicey in the middle innings, the Indians held on to get him his first decision in six weeks. 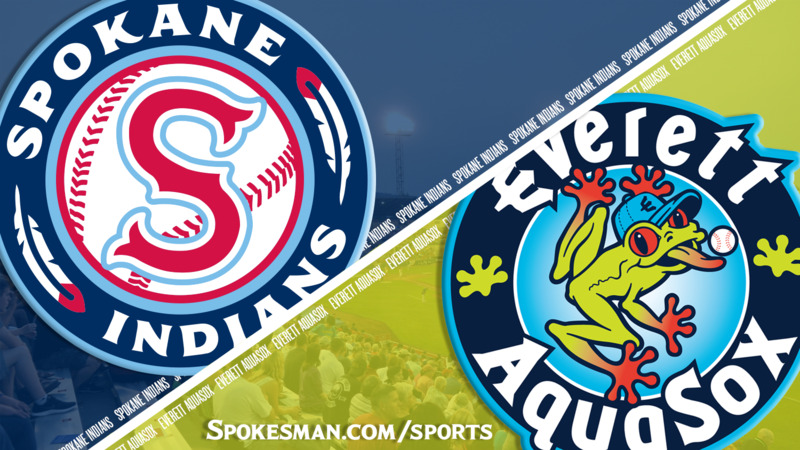 Curtis Terry hit his league-leading 14th home run of the season, Jax Biggers added his first career round tripper and the Spokane Indians beat the Everett AquaSox 7-3 in the first of a three-game Northwest League series at Avista Stadium. Tiedemann (2-2, 4.28) struck out five and walked four in 5 2/3 innings and watched as the AquaSox rallied for two runs in the sixth and one in the seventh, turning a 5-0 game into a nailbiter. But Biggers’ two-run shot in the bottom of the seventh provided necessary cushion – though not without controversy. Biggers’ homer, a moon shot down the line in right, was ruled fair by home plate umpire Mitch Leikam. Several AquaSox protested, and manager Jose Moreno came out to pick up their fight. Moreno got so close to Leikam their caps touched, and Leikam finally rang Moreno up. The first two batters of the ninth walked against Xavier Moore, but Diosbel Arias snagged Josh Stowers’ hard grounder to third, falling on his rear, and made a strong throw to second to start at 5-4-3 double play. Moore picked up a strikeout to end it and put Tiedemann and the Indians (11-8) back in the win column. The Indians built a lead for Tiedemann in the second. Biggers led off the inning with a single and moved up when Francisco Ventura walked. Starling Joseph singled to load the bases with no outs. AquaSox starter Cody Brown uncorked a wild pitch and Biggers scampered home. Jonah McReynolds walked to load them up again and Tyler Depreta-Johnson grounded into a 6-4-3 double play, but Ventura scored on the play to make it 2-0. Hasuan Viera started the third with a single the other way and NWL home run leader Curtis Terry crushed one to dead center for his 14th of the season. Meanwhile, Tiedemann cruised, retiring 10 in a row from the last out of the second through the fifth inning. In the fifth, Everett’s Ryan Garcia bounced one up the middle but Tiedemann used all of his lanky frame to snag the high chop and calmly underhanded to Hasuan Viera at first for the out. With one down in the fifth, Terry lashed a single to center and Arias walked. Biggers hit a sharp grounder to second which ricocheted off Bobby Honeyman’s shin and into short right, allowing Biggers to reach, Terry to score and Arias to hustle to third. The rally stalled though, as Ventura and Joseph struck out to end the threat. The AquaSox finally got to Tiedemann in the sixth. With one down, Seattle Mariners 2018 second-round pick Josh Stowers drew a walk, went to second on a groundout and came around on a single by Cal Raleigh, the M’s third-round selection. Tiedemann followed that with a walk to Connor Kopach, and manager Kenny Holmberg came out with the hook. Kyle Keith entered and gave up a run-scoring double to Jansiel Rivera before getting out of the inning with a 5-2 lead. Keith loaded the bases with one out in the seventh on a pair of singles and a walk – though he took exception to the ball four call – and Holmberg made a call to the pen for Cole Uvila. Honeyman greeted Uvila with a line-drive RBI single to make it 5-3, but the righty struck out the next two to keep it a two-run game. With one down in the bottom half Terry walked on a 3-2 pitch and trotted home on Biggers’ big fly. Published: Aug. 14, 2018, 9:48 p.m. Updated: Aug. 14, 2018, 10:48 p.m.